Mission Hills Group — impetus for China’s golf boom and owner and operator of the world’s two largest golf properties — announces the accolades continue for its Blackstone Course at Mission Hills ▪ Hainan, host of the recent Mission Hills Star Trophy celebrity pro-am. GOLF Magazine’s January issue names the par-73, 7,808-yard layout 2010’s "Best New" Asian design. This marked the first time courses in the Pacific Rim were ranked on the annual list, evidencing golf’s continuing shift of power to the East. Designed by 25-year industry veteran Brian Curley, Blackstone is a 350-acre core golf course set on a dense bed of lava rock. It weaves through a striking landscape of mature trees; thick, jungle vegetation; and expansive lakes and wetlands. Wild, irregular bunker edges and transitional sand areas harmoniously converge with volcanic outcroppings framing many holes. Featuring no rough, the hard-line edges associated with most golf courses are non-existent. The Blackstone recently welcomed Hollywood stars like Catherine Zeta-Jones, Matthew McConaughey, Christian Slater and Hugh Grant for Asia’s first international celebrity pro-am golf tournament, the Mission Hills Star Trophy. "It’s a beautiful track, says McConaughey. "Long, manicured, none of the holes were tricky, every hole was playable, and the greens were beautiful." Adds Zeta-Jones: "You really have to see Mission Hills to believe it. With the facilities, if you’re a golfer, this is heaven." Located on tropical Hainan Island, the world’s hottest spot for luxury development, Mission Hills ▪ Hainan is only 15 minutes from Haikou Meilan International Airport. It features 10 golf courses skillfully routed through the striking volcanic landscape, 518 tastefully-appointed guest rooms and suites, 12 world-class restaurants, Hainan’s only aquatic theme park, therapeutic natural mineral springs, a spa oasis and more. The Mission Hills Group, owner and operator of Mission Hills – Shenzhen and Mission Hills – Hainan, is the pioneer in China’s fledgling hospitality, sports and leisure industry. Mission Hills – Hainan lies in the volcanic region of exotic Hainan Island, China. The resort sets a new standard in leisure, recreation and wellness experiences. Nestled amid lush, green gardens, it caters to golf enthusiasts and comprises specially-designed golf courses, each incorporating native lava rock formations. Other state-of-the-art features include 518 elegantly designed guest rooms and suites, a three-story clubhouse, China’s first Hank Haney Golf Academy, meeting facilities, 12 world-class restaurants, a fully-equipped sports and recreation center, Hainan’s only aquatic theme park, therapeutic volcanic mineral springs, a spa oasis, and shopping arcade. 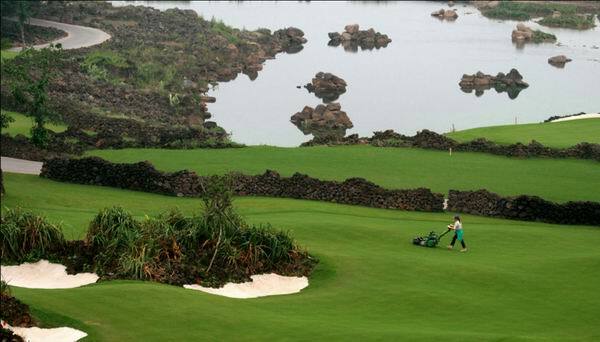 Mission Hills – Hainan’s Blackstone Course hosted the first inaugural Mission Hills Star Trophy in October 2010, a ground-breaking celebrity pro-am golf tournament in Asia. It is also home to the Omega Mission Hills World Cup in November 2011. A magnificent addition to Hainan’s tropical island paradise, Mission Hills – Hainan is poised to become the island’s premier sanctuary, attracting visitors from around the globe. Getting There: Mission Hills ▪ Hainan is 15 minutes from Haikou Meilan International Airport (HAK). Flights from major cities throughout Asia — including Beijing, Guangzhou, Hong Kong, Shanghai and Singapore — are available on Air China (Star Alliance member), Asiana (Star Alliance member), China Eastern Airlines (SkyTeam Alliance member), China Southern Airlines (SkyTeam Alliance member), Hainan Airlines, Hong Kong Airlines, KLM, Shanghai Airlines (Star Alliance member) and more. For more information about Mission Hills, visit www.missionhillschina.com, email info@missionhillschina.com, or call (852) 2122 1616 (Hong Kong) — (86 755) 2802 0888 (Shenzhen) — (86 769) 8728 8888 (Dongguan) — (86 898) 6868 3888 (Hainan).